The dark season in the Arctic is a good period to get desktop table projects done which have been waiting already for too long. Such as getting the collection of 360 degree panoramas from Barentsburg sorted, which until now had been cramped together on just one page, making it difficult especially for those who had not been to Barentsburg in real life to understand there whereabouts. Now, nagivation is much easier, as all places have got their own individual page and now the brewery “Red bear”, the hotel, Lenin, the old museum in the Culture House, the chapel and other sites are accessible through a map which provides easy orientation. Barentsburg Panorama: Lenin in focus. 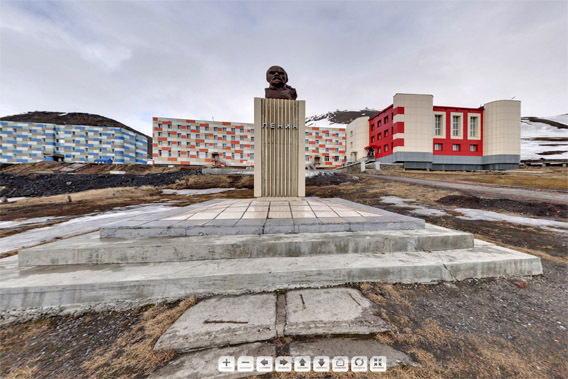 Click here to access the map with the Barentsburg panoramas and enjoy your virtual tour!